On Tuesday my prescriber told me that I’m doing great, switched my prescription to one dose per day, and said to come back in 3 months. I’ve started addressing my social anxiety with help from my music therapist, Wakana. The last couple days have been a fun reunion with dear college friends. Honestly, the only not-so-awesome thing going on for me right now is the problem with my computer… and even that seems close to being resolved. I’m doing this re-post because I’ve started obsessively practicing lines for the first couple episodes if I ever do a Let’s Play of The Elder Scrolls V: Skyrim. It’s kind of annoying because I’ve already said the same things many times, and yet I still feel compelled to repeat them over and over. It’s better than having a panic attack because a bee bounced off my windshield while I was driving, imagining wasps attacking me, or being afraid to look in the mirror at night because I was traumatized by a movie I watched as a pre-teen, though. My anxieties – social anxiety, general feelings that something horrible will happen, and my bee/wasp/hornet phobia – have been flaring up like crazy lately. It kind of makes sense that my defense would be to concentrate on a fantasy world, where I can load from a recent save if I don’t like what happens. The lines I’ve been practicing focus almost exclusively on character creation, the one part of the game over which the player has nearly total control. Some of the other characters in Skyrim say very mean things to the player character, especially if you’re playing one of the less popular races. […] I’m still concerned that hearing negative talk consistently for hours at a time can be harmful… at least for me. 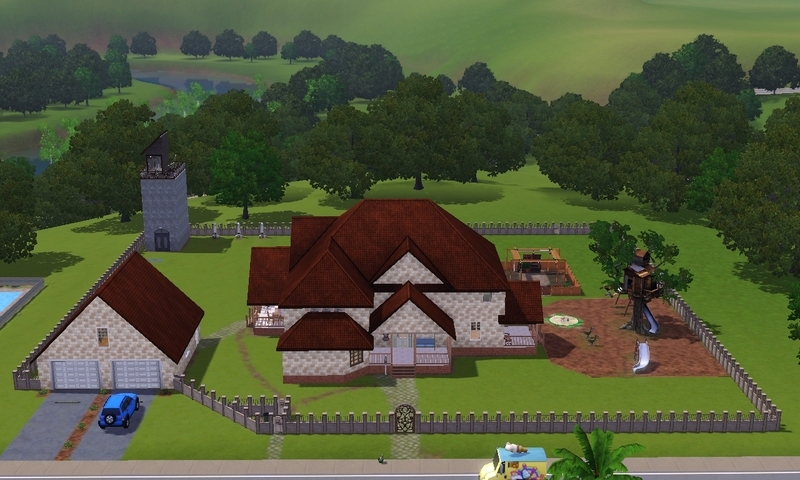 This is the fourth installment of my Sims 3 Legacy. 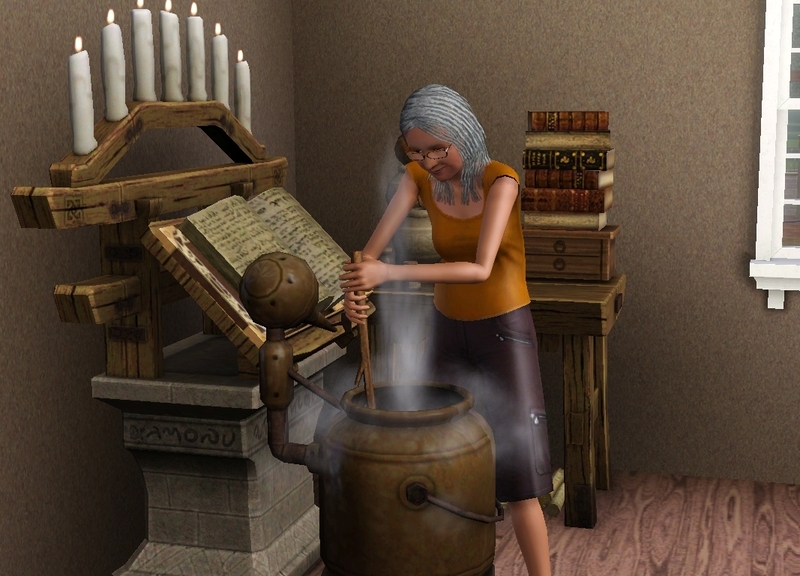 It picks up where Part 3 left off: with Nash inventing and Nicole vigorously studying Alchemy in order to produce an elixir that can cure transformed sims. Nash and Nicole’s aunt Mira retired as soon as she reached the appropriate age – none of this “waiting until I’m about to die” nonsense her mother and sister did. This enabled Mira to fully enjoy her golden years receiving a hard-earned pension. She spent as much time as she could in werewolf form, finding a variety of rare and fascinating metals, gems, and insects. When not hunting, she went on dates with her girlfriend and helped raise her niece’s children. The Riverview Association for Amateur Archaeologists (RAFAA) caught wind of some strange, seemingly sim-made protrusions coming out of the ground in a grassy, undeveloped area near the fish hatchery. When they excavated, they discovered a peculiar door that seemed to lead to nowhere. 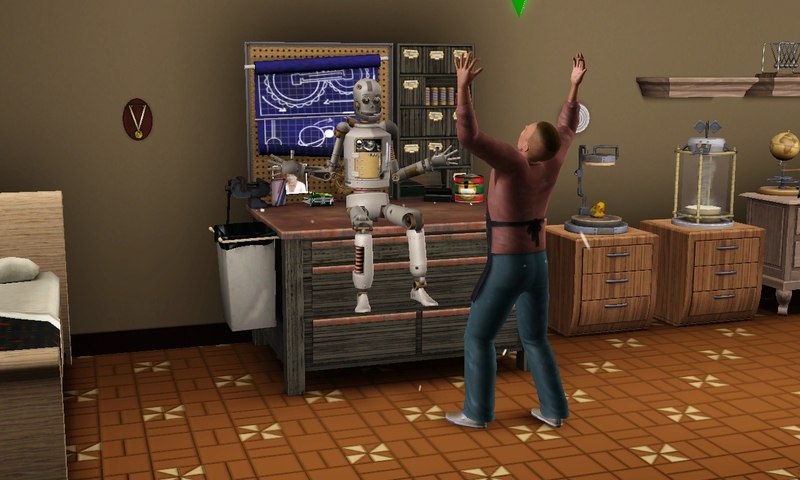 Perplexed, they withdrew to covertly observe what happens when sims interact with their discovery. The site has since become a popular place to hang out, though a few outsiders have suddenly gone missing. To Nicole and her high school sweetheart, Savannah Drummond, it seemed the perfect place to go for a date. They were pleasantly surprised to learn that, by knocking on the door, they could talk to Death – without dying! Nicole felt that Death owed her one for ruining her high school graduation ceremony. So, she requested a new life – a pregnancy – created from a combination of her and Savannah’s genes. Death summons a bolt of light that strikes at Nicole’s feet, causing her to become pregnant. Nicole’s girlfriend, Savannah, watches nearby. The thing is, such a merger defies the laws of nature – and that is risky. The two children Nicole conceived in this manner (on two separate occasions) “dance to the beat of their own drummer,” somewhat out of touch with the reality most sims agree on. Perhaps they are more in touch with another reality, such as that beyond the grave? I gave Nicole’s daughters the “insane” trait to reflect that their ways of being in the world seem … a bit odd … to other sims. I share some of their tendencies, particularly talking to myself (or perhaps it’s more accurate to say that we talk among ourselves almost constantly very frequently “all the time” – and seldom agree have trouble coming to a consensus). 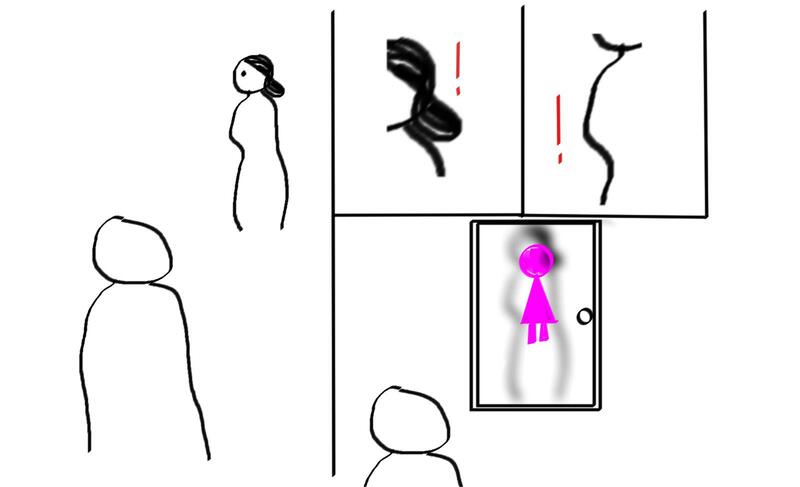 Most notably (and refreshingly) they don’t lose focus whenever they are in the same room as a ghost; I guess seeing dead people is “normal” to them. While Nicole was negotiating with Death, her brother Nash was hard at work inventing. He moved his bed into his workshop to make it easier for him to stay up most of the night working on his craft. 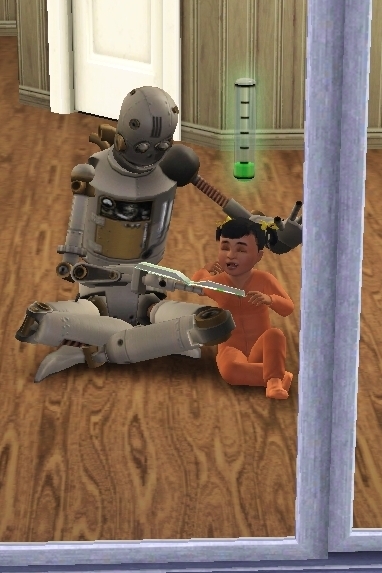 Nash named the simbot Josiah and adopted zir into the family, where ze was fully accepted and loved. A good-humored virtuoso, Josiah learned to play guitar with ease and became an active member of a local rock band. When not practicing or performing, ze helped to care for Oma and her younger sister, Olive. Life in the Legata household was going well. 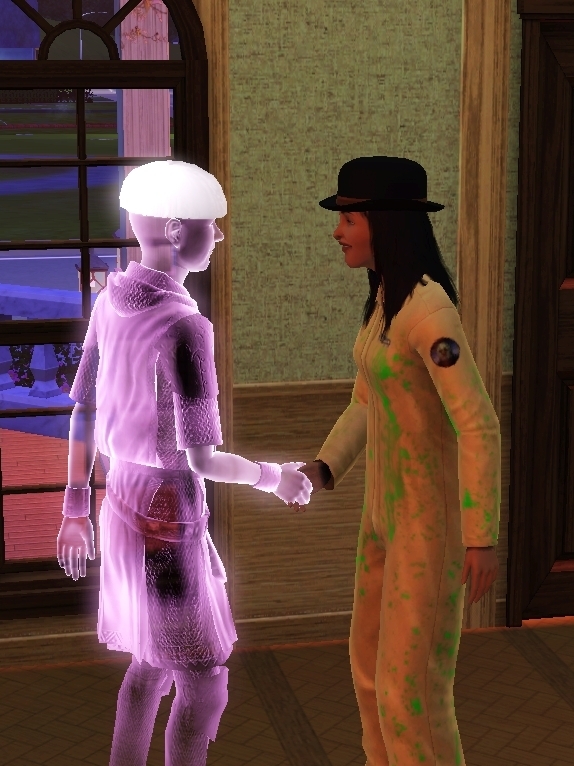 The children were well cared-for, Nicole learned to create her elixir and used it to cure many sims of zombie-ism, and Nash turned to improving his handiness so he could keep Josiah in good health. 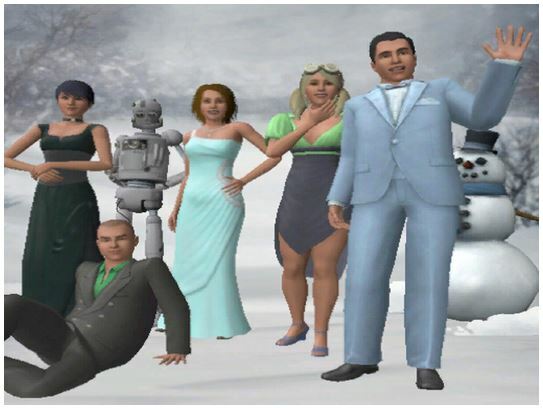 Josiah (far left, holding Olive), Mira (left center), Nicole (right center), Nash (far right), and Oma (seated in foreground) pose together in front of a wintry backdrop. Then Oma, ready to grow up into a teenager, had her birthday on the night of the full moon. When she went to blow out the candles, her cake mysteriously caught fire! At the same moment, Mira died of old age. Death seemed to gloat as ze claimed her, further influencing the life ze had helped create: Oma developed the “brooding” trait, which predisposes her to melancholy thoughts about existential issues. It reminds me of my tendency to ruminate, especially when my depression symptoms are stronger. During Mira’s funeral, Death visited once again – this time to claim Josiah. 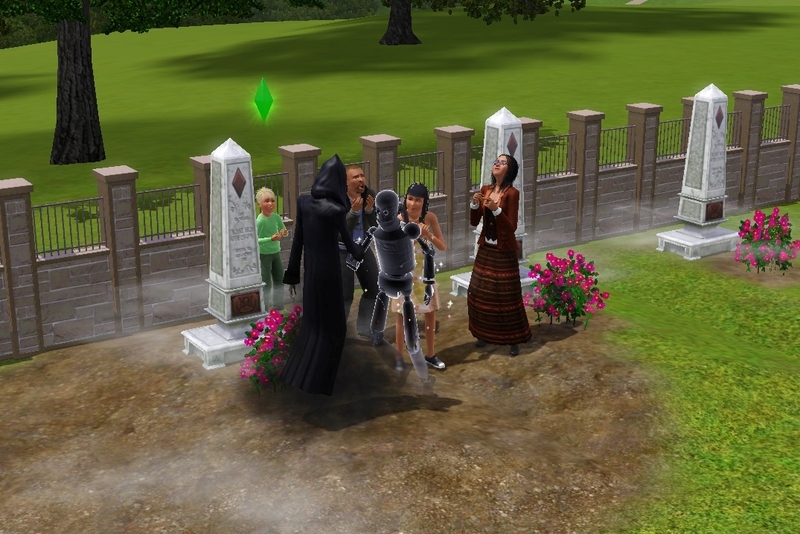 The simbot greeted Death graciously, but the rest of the family was devastated. Josiah shakes hands with Death, surrounded by zir family members (who are crying). They stand atop a recently-filled grave, with two other tombstones visible in the right-background. The loss of two family members hit the Legatas hard. 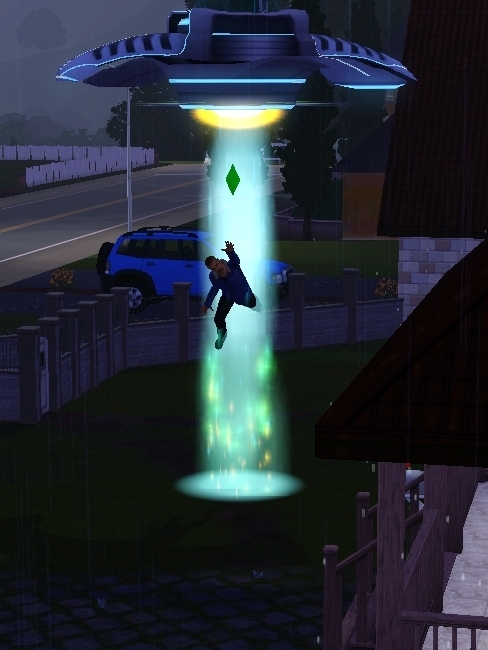 Nash is abducted by aliens in his own front yard! Nash swore off inventing and lacked focus … until he was abducted by aliens. They ignited a his passion for – no! obsession with – all things having to do with outer space. He built a tower between Mira’s and Josiah’s graves, equipped it with the basics he needed to survive, topped it with telescopes, and retreated from everyday life. (This enabled him to master the logic skill, the third and final skill he needed for the lifetime wish: “Renaissance Sim.”) Though he has identified several celestial bodies, he has yet to find whatever it is he is looking for. Oma sits cross-legged, deep in thought about her heartache. 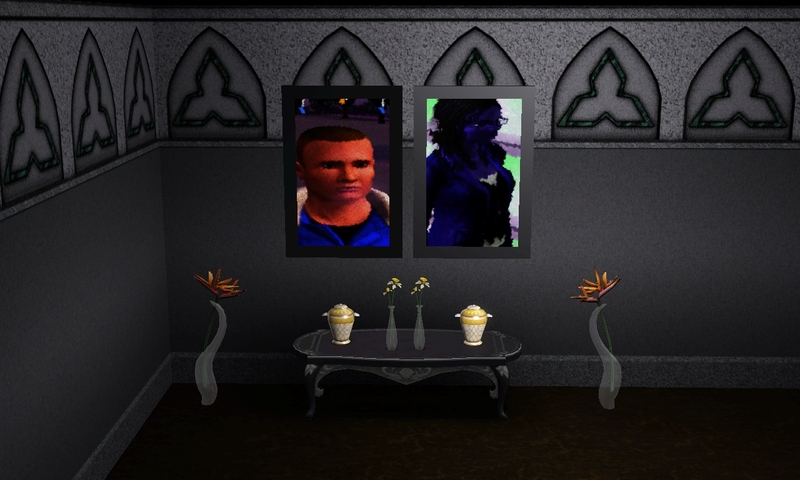 The graves of Mira, Lisa, and Melanie are visible through the window. Oma spent hours contemplating both the meaning and the hollowness of reality. Though her brooding did not interfere with her school performance, it limited her ability to develop skills, socialize, and otherwise live a fulfilling life. Suddenly finding herself in the middle of a body of water, Olive looks around anxiously. 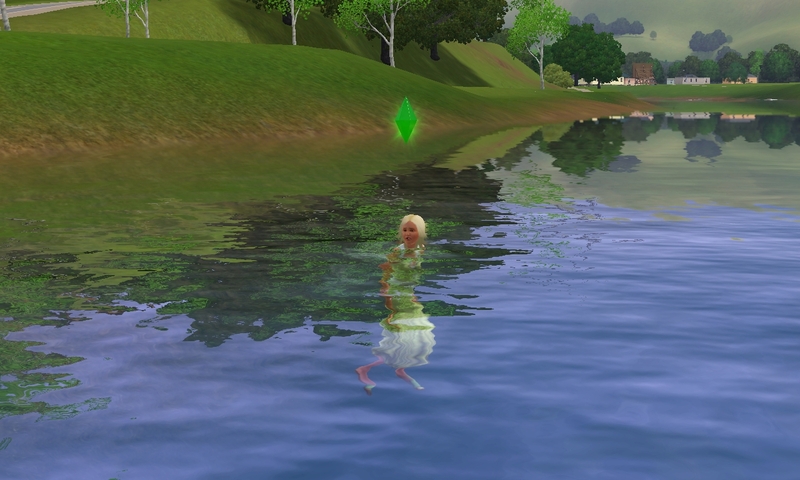 Since becoming a teenager, Olive has been having sudden impulses to run out into the nearest body of water and swim. She suddenly realizes she is in deep water and becomes anxious and disoriented. Fortunately, she has thus far been able to find her way back to dry, solid ground. No one has been able to explain the reason for – or meaning of – these impulses. Oma’s transition to young adulthood went smoothly enough, considering the circumstances. She graduated with honors at the top of her class. 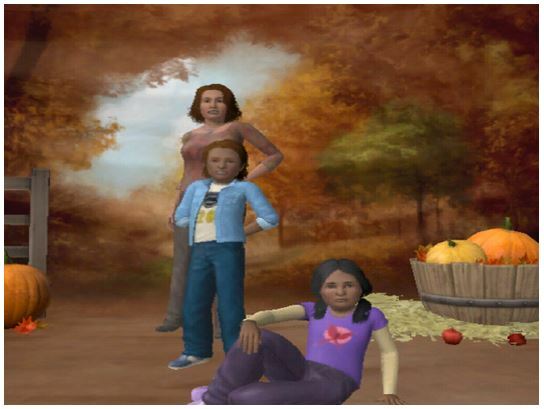 The family went to the Fall Festival immediately afterward to take a photo together and celebrate. Nash, Nicole, Oma, and Olive pose in front of an autumn backdrop after Oma’s graduation from high school. 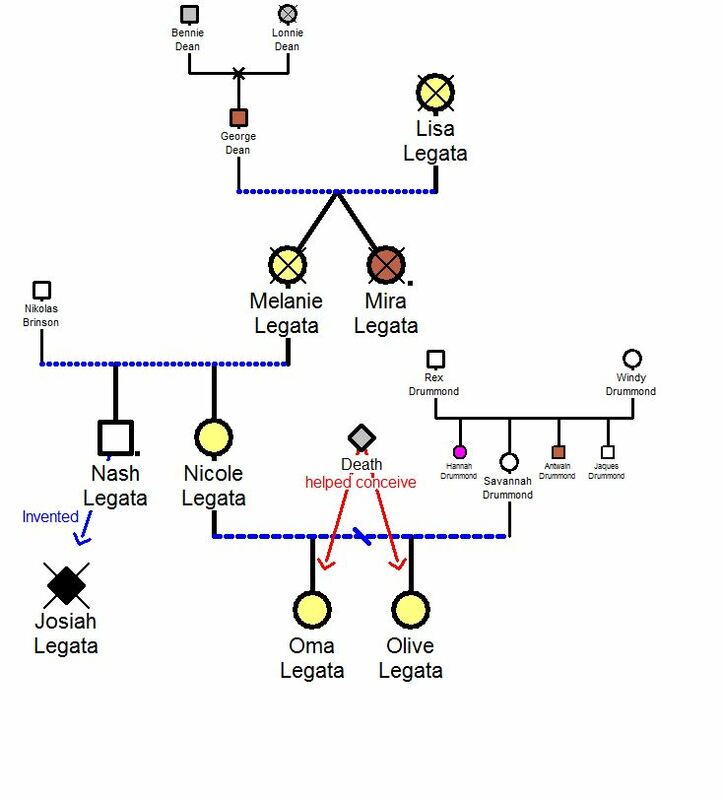 Below is the updated version of the Legata family tree. Mira’s symbol (just right of center) is now crossed out to show that she is deceased. 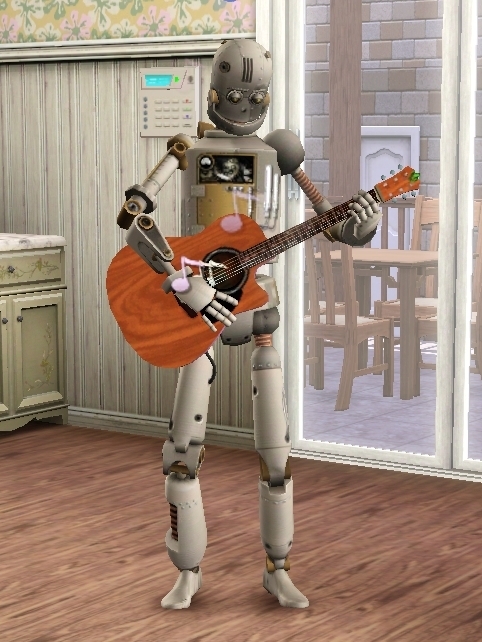 I added a diamond to represent Nash’s simbot, Josiah, in the lower left. It is filled with black to show that ze was a simbot, and crossed out to show that ze is also deceased. A blue arrow with the word “Invented” shows that Nash created Josiah. 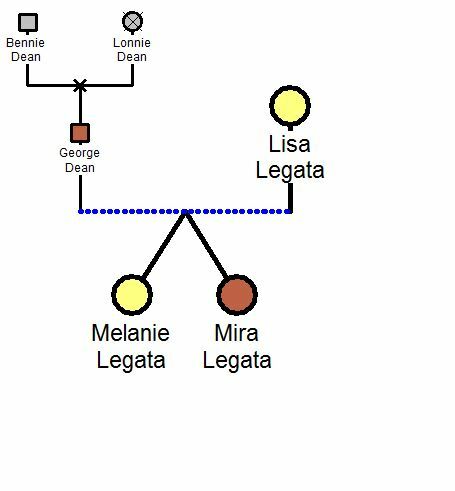 I added the family tree of Nicole’s ex-girlfriend Savannah on the far right side of the Legata family tree. 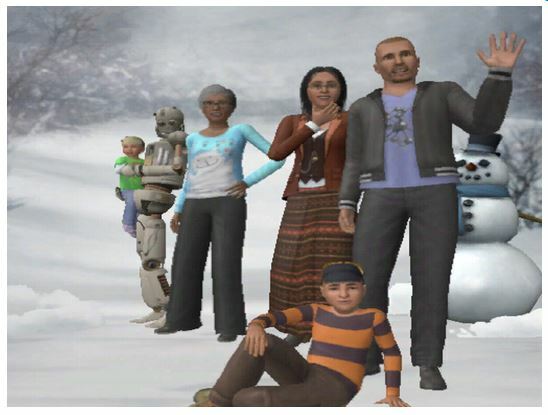 The symbols for Savannah, her father (Rex), mother (Windy), and youngest brother (Jaques) are filled with white to show that they are “normal,” non-magical sims. The symbol for her sister Hannah is filled with fuchsia to show that she is a vampire. The symbols for George Dean (upper left), Mira Legata, and Savannah’s brother Antwain are filled with reddish-brown to show that they are werewolves. Death is represented near the middle of the family tree by a diamond (filled with gray to show that zir “supernatural status” is unknown). Red arrows point from Death to Oma and Olive to show that Death helped Nicole conceive them. Finally, the symbols for Oma and Olive (bottom center) are filled with yellow to show that they, like their mother (Nicole), grandmother (Melanie), and great-grandmother (Lisa), are witches! The Legata Family Tree, generations 0, 1, 2, 3, and 4. Oma met a fellow witch named Quintin Beaulieu at the Fall Festival and quickly fell in love. She slept with him that very night. Several urgent visits to the bathroom later, Oma discovered that she is pregnant with her first child! 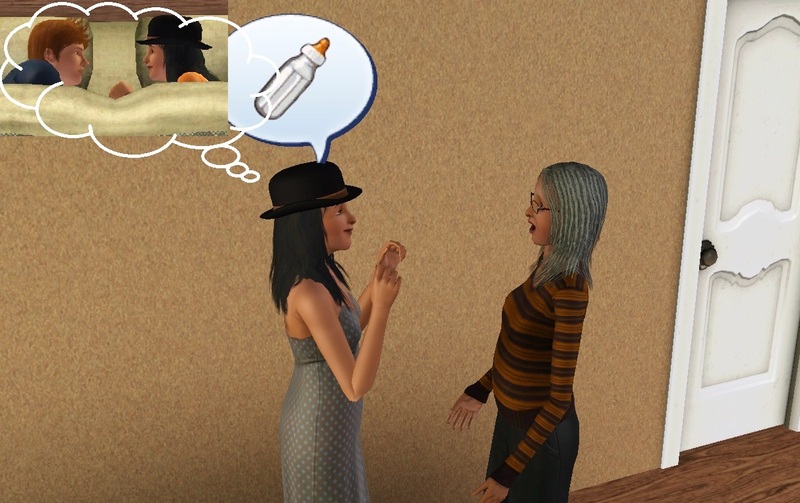 Nicole (right) is shocked to learn that Oma (center) is pregnant at such a young age. In the thought bubble (upper left corner) Oma remembers the night she spent with Quintin (left). 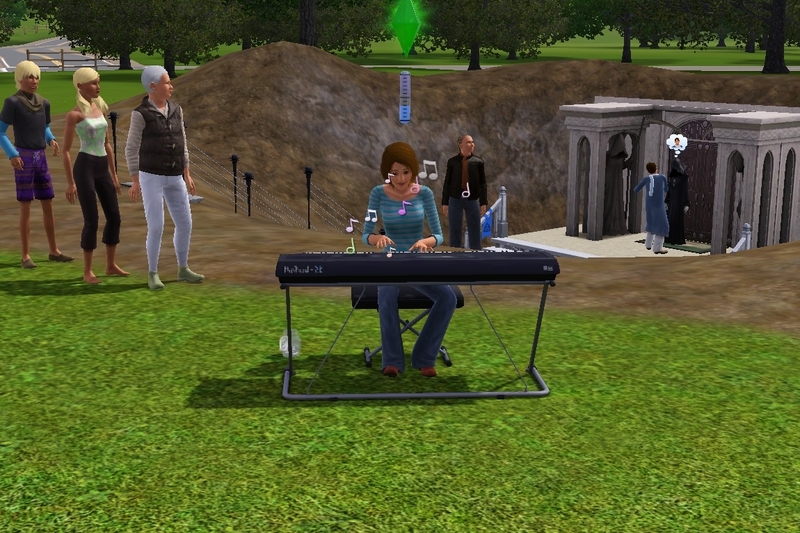 On Sunday I introduced the founder of my new Sims 3 Legacy family. 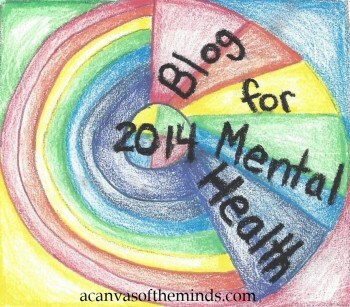 This post continues her story and introduces her twin daughters. Meet the Legata family, pictured below. 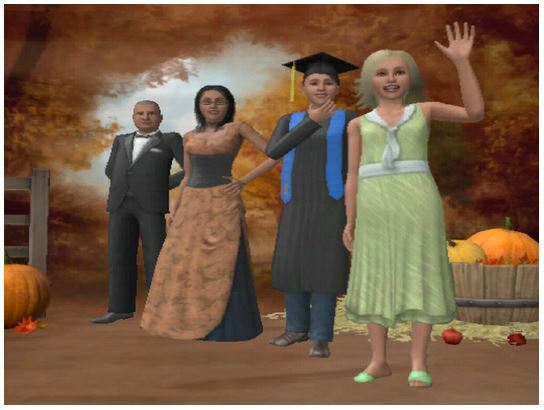 Lisa (standing, far back) is the legacy founder, the sim I made in Create a Sim. Melanie (seated in front) was the first twin to be born; she is a witch like Lisa. Mira (standing, middle) was the second twin to be born; she is a werewolf like her father (not pictured). Lisa Legata (back) poses for a “Spooky Day” picture with her daughters: Mira (middle) and Melanie (front). I created the family tree below using Genopro Genealogy Software. I’m using color coding to show how supernatural status (human, witch, werewolf, etc.) is passed down from one generation to the next. The symbols for the twins’ paternal grandparents (top left: Bennie & Lonnie Dean) are shaded gray because their supernatural status is unknown. The X through Lonnie’s symbol indicates that she is deceased. The symbol for the twins’ father (George Dean) is filled with reddish brown to show that he is a werewolf, as is the symbol for Mira (bottom right). The symbols for Lisa (top right) and Melanie (bottom left) are filled with yellow to show that they are both witches. The line connecting George and Lisa is blue and dotted to show that they had a short-term, uncommitted relationship – in other words, they dated for a while. Melanie and Mira are connected to this line at the same point, forming a bottomless triangle, to indicate that they are fraternal twins. (If they were identical, the triangle would be complete.) 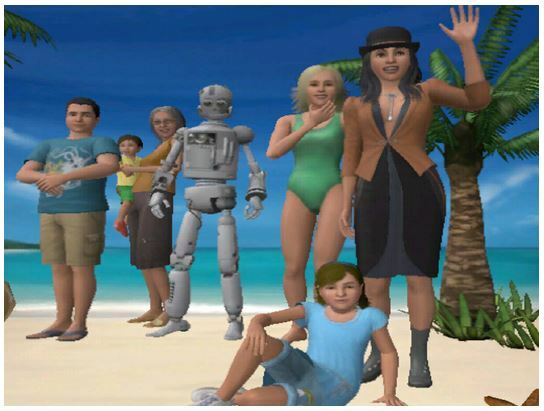 Symbols for sims in my active household (the Legata family) are considerably larger than symbols for sims outside the household (Bennie, Lonnie, and George Dean). 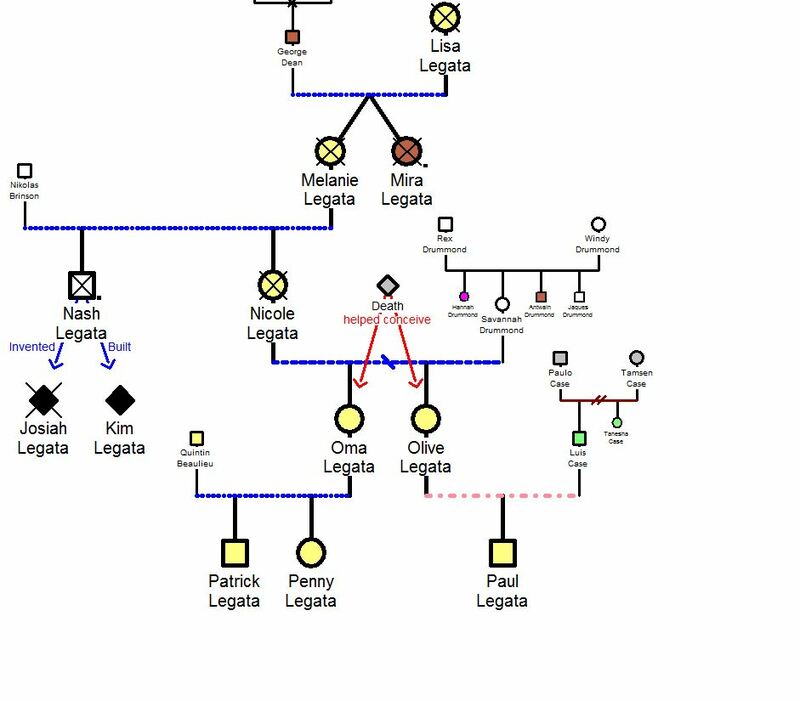 The Legata Family Tree, generations 0, 1, and 2. Raising the twins on her own was not easy, especially since Lisa was also working full time. She struggled to manage everyone’s needs and teach the toddlers skills essential for their development. Due to their rough start, I was unable to select traits for the twins when they grew up into children. 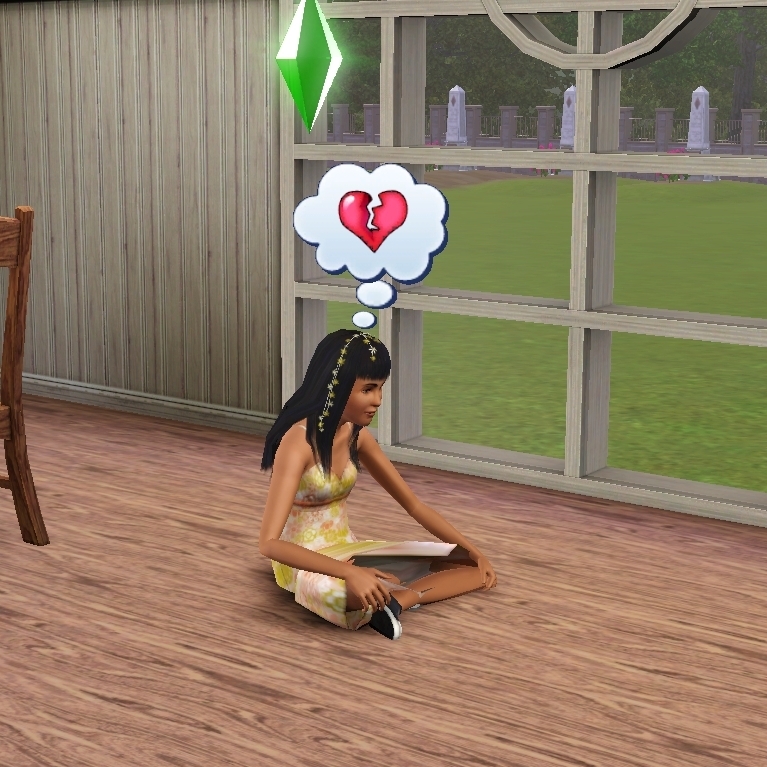 Melanie gained the “grumpy” trait, which has elements similar to my experience of depression (when it’s relatively mild): she can function normally most days, but her mood is lower than it would be for sims without the trait, all other things being equal. At times she feels sad or angry for no reason. It is difficult for her to enthuse about the good things in her life, including her accomplishments. Some days she randomly wakes up feeling “out of sorts,” which affects her entire day (23 hour moodlet). This predisposes her to worse moods and limits her ability to feel happy. The twins were less dependent as children, so life in the Legata household became much easier. 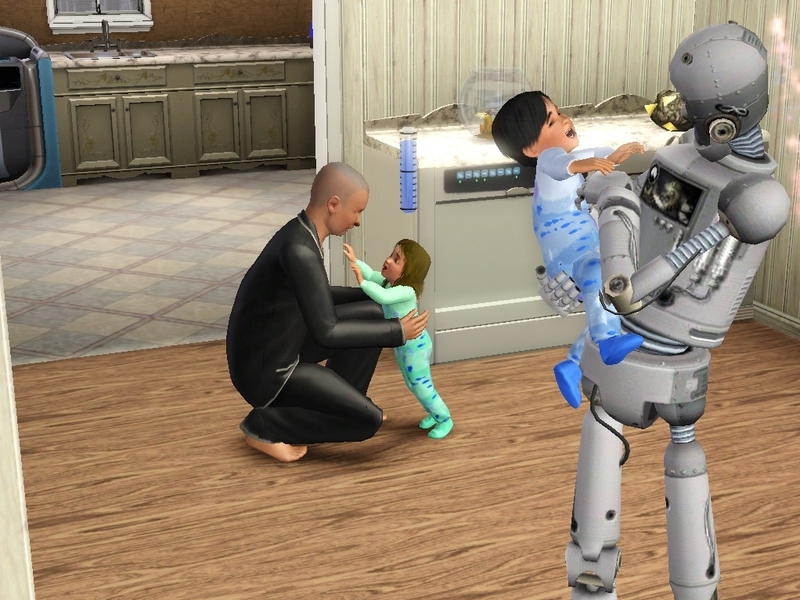 Lisa alternated among progressing her career, developing the magic skills she would need to cure transformed sims (her life goal), and caring for her children. Melanie and Mira did well in school and enjoyed playing dress up and pretend. Mira discovered a lifelong love for transforming into a werewolf and hunting for metals, gems, and insects. Melanie’s magic abilities didn’t manifest until she was a teenager, but once they did she began enthusiastically learning new spells. Each twin held down a part-time job through high school. Unfortunately they missed a lot of school due to snow days, so they were barely able to pass with acceptable grades (B and higher). I was able to choose a trait for Melanie, who had taken advantage of an opportunity that boosted her grade to A. Mira was assigned a random, relatively neutral trait. 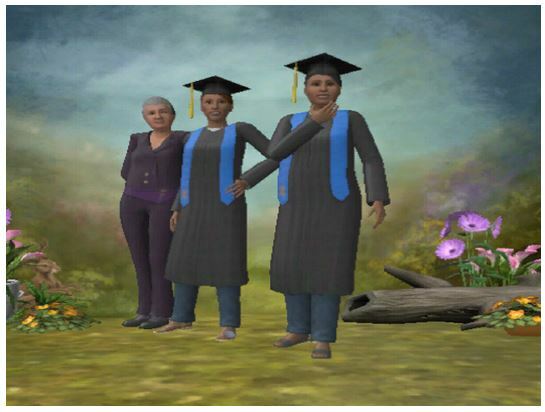 They were both thrilled to graduate from high school and enter young adulthood. Lisa, Mira, and Melanie on graduation day! As soon as they graduated, Melanie entered politics and Mira joined the military. Their life goals are to become the Leader of the Free World and an Astronaut, respectively. Toward those ends, they have been training and networking relentlessly; Melanie has become quite the expert at hosting fun and profitable campaign fundraisers! Meanwhile, Lisa continued climbing the journalism career ladder, while simultaneously using magic whenever possible. She magically upgraded every appliance, electronic, and plumbing fixture in the house. She cast good luck charms on everyone she met. 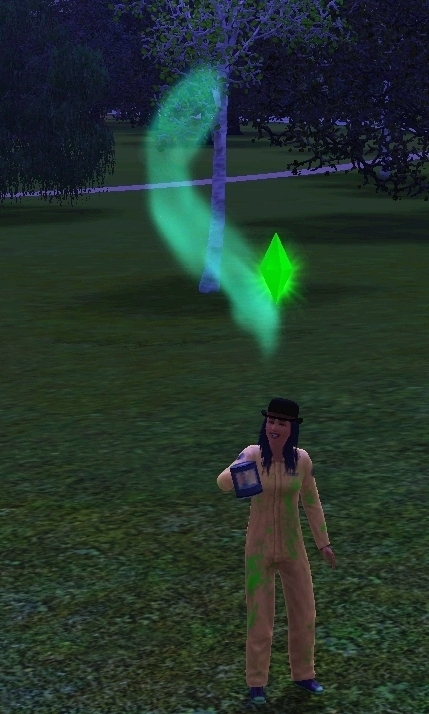 She even gave in to the temptation to turn sims into toads! But no matter how much she practiced and experimented and studied, she could not learn the spells necessary to accomplish the kind of magical healing that had been her lifelong goal. 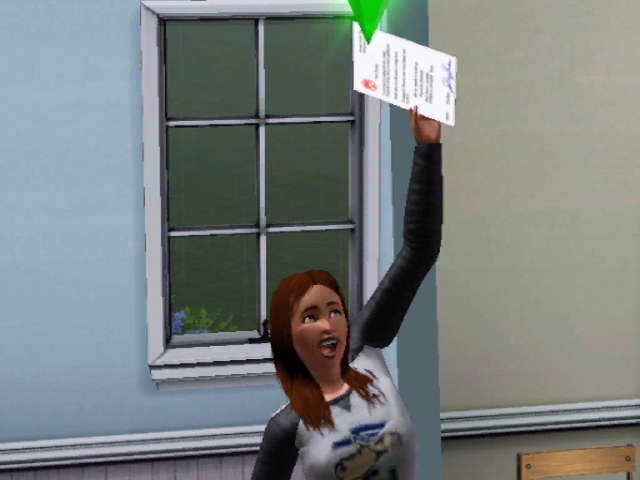 So, instead, she focused on her career (in other words, I used her happiness points to buy the “change lifetime wish” aspiration award) and became a rather prolific writer. Among other things, she wrote: two memoirs, a survey of the supernaturals in Riverview, and an exploration of Possible Solutions to Riverview’s Zombie Problem. Lisa’s dedication (that is, my gaming strategy) paid off: she fulfilled her late-in-life goal of becoming a Star News Anchor! She looks forward to retiring and (hopefully) helping to raise grandchildren. 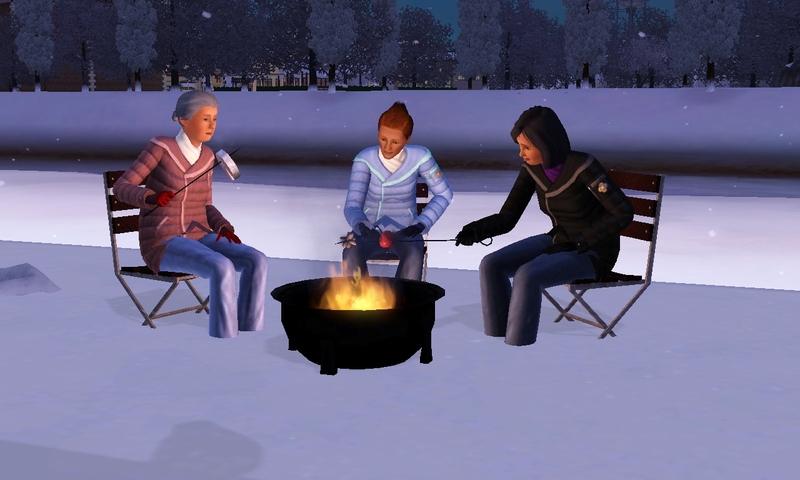 Lisa, Mira, and Melanie roast food items over a fire pit. 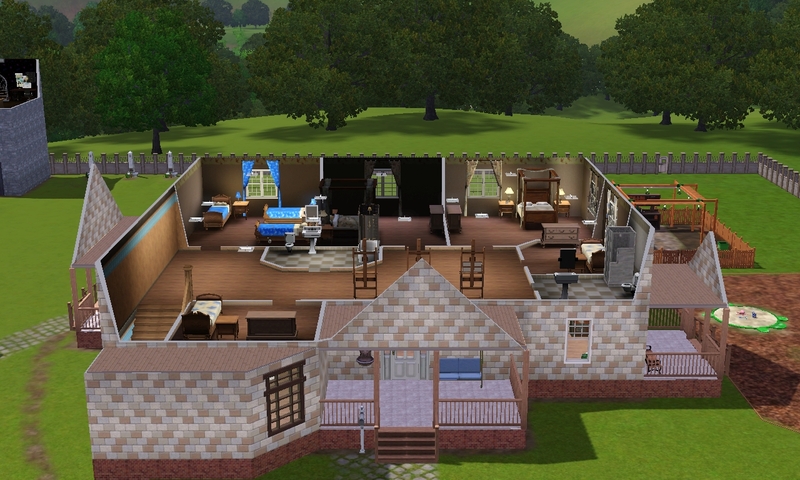 To be honest, I probably haven’t been expanding the legacy house as much as I should be: the whole family is still sharing one bedroom. It’s not a particularly large bedroom either; Melanie and Mira never graduated from sharing bunk beds. However, they now have a state-of-the art kitchen, spacious dining room, and outdoor eating area complete with a very nice grill. Each of these rooms has a dishwasher and trash compactor, so there is no excuse for leaving dirty dishes everywhere. 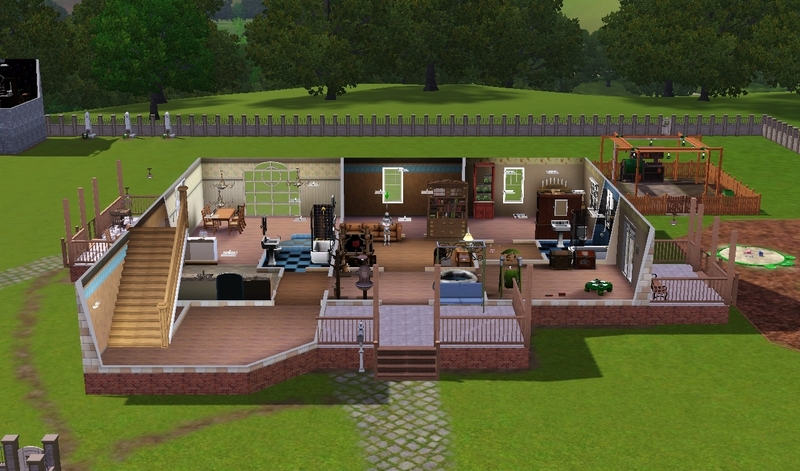 I also added a half bath, which is accessible via the dining room. Mira’s garden is visible in the background of the screenshot below; it looks like it’s coming out of the bedroom wall, but it’s actually a separate outdoor space, fenced off to protect her plants from zombies. The legacy house with some walls cut away to show all the rooms. Picture taken on the diagonal with the front porch/original gazebo to the far right. No, I think the problem is that she kissed another sim once. 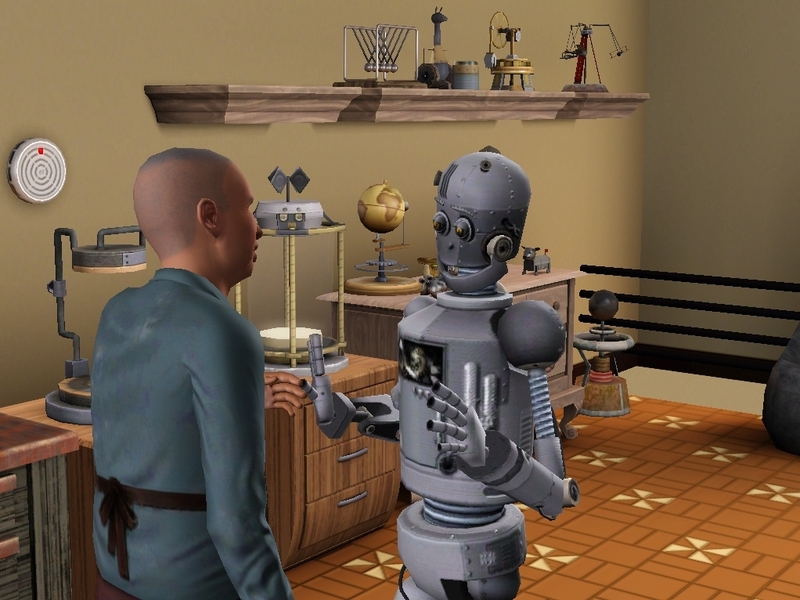 Despite the fact that they never became boyfriend and girlfriend, and they haven’t had romantic interactions in the sim equivalent of real-life years, my sim has a “naughty” reputation for pursuing a new love interest. The sim she wants to have children with may never consent to it, even if I buy the aspiration award that would clear her reputation (aptly named “clean slate”). She needs to hunt down this guy she hasn’t done anything with in years – who’s probably become involved with at least one other sim since – and tell him she’s no longer romantically interested in him. If that doesn’t work, she has to tell this guy who won’t have romantic interactions with her that she wants to “just be friends” – before she kisses anyone else. Whether she breaks up with them or not, they’ll both be annoyed with her. I think Mira has a much better idea: she’s in love with her best friend but has yet to become romantically involved with her. Perhaps it’s best to keep it that way… at least until either she or her sister has a daughter. I find reputations very annoying. I have to admit they’re quite realistic, but the game imposes a double standard that’s driving me crazy. Sims outside my control keep bombarding my sims with love letters and flirting with them, even when my sims are married and have “eternally faithful” reputations. Heck, outside sims will flirt with one member of my active family, then turn around and flirt with another in the same room! But the instant my sim acts on her (or his) romantic attraction – even in the privacy of their own home – they are judged for it. Boo game, booooo. I guess the lesson is: it’s better to communicate clearly, even if it’s considered “mean.” Riverview is going to be full of broken hearts. I finally did something I should have done at least 2 years ago: I contacted the disability resource center on campus regarding accommodations for my mood disorder. It feels like signing my own death sentence, or at the very least admitting defeat. I would never have done it, but I need an extension to complete my degree (I “should” be graduating this semester) and my academic adviser suggested this as my first step. I’ve been putting the whole thing off because of internalized stigma around mental illness, and possibly also some ableism. Saying I have a disability – rather than “I’m going through a rough time” – marks me as different, deficient, other. Possibly for life. Life is chaotic. Our society isn’t built for people like me. (It actively and persistently oppresses us.) I can learn, grow, adapt, take meds, reach out for support, request accommodations… I recently learned about MTHFR mutations and suspect they may be a contributing factor; I plan to talk to the APN about genetic testing and supplements that might be helpful, in hopes we can get my insurance to cover them. But even with that: much if not most of the food that is available to me has been “fortified” with folic acid, the very substance that may be interfering with my body’s functioning. My point is, social, institutional, economic, and other norms need to change before marginalized groups and individuals will be able to live “normal” lives. 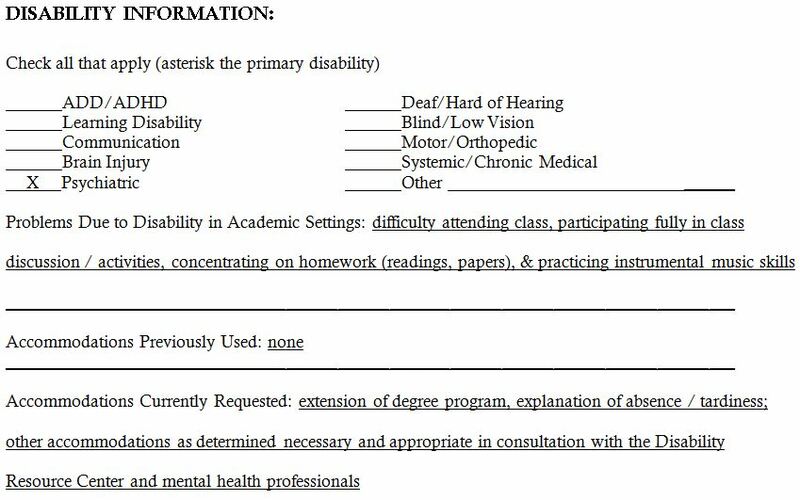 One of the things that makes requesting disability accommodations at school so painful is that academic excellence used to be a major strength – possibly the major strength – I relied on to survive. I wasn’t being challenged on my level in elementary and middle school, so all I really had were my grades. They were my proof that I was worthy of existing. They provided some stability in a chaotic home. Even as I began to be challenged in high school and undergrad and developed a love of learning, my grades were a primary source of self-confidence and pride. Academic excellence was – and to some extent still is – an important part of my identity. Too bad it doesn’t actually mean all that much in the real world. Maria was very happy to receive an A for the term! Now my classes aren’t really about learning information and answering questions on a test or writing papers. 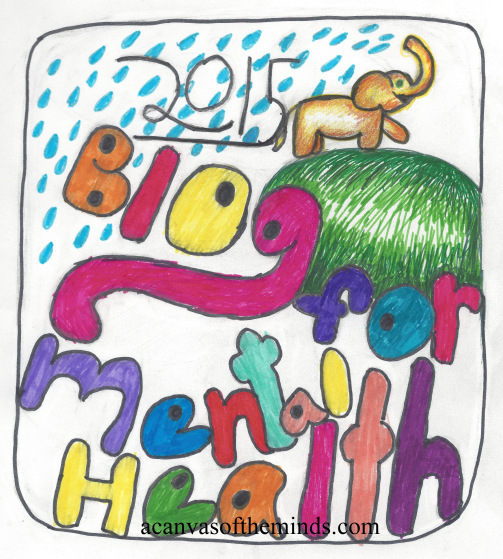 I can do those things – when I manage to concentrate, which is becoming quite difficult. They’re about practical skills, social skills, being and doing and interacting – often on a deeply personal level. They’ve been churning up the painful realities of my life – that’s what forced me into therapy. I can’t just put my blinders on and memorize facts anymore, I have to look in the mirror, internalize things, face my worst fears, and guide others through them. I think Wakana and I could come up with something useful for most of those items, but we’ve drawn a blank when trying to come up with specific accommodations relevant to an academic setting that would actually help me. (I doubt “not having to demonstrate the skills I’m supposed to have been developing over the course of the semester” is an option.) That’s part of why I wanted to talk to the head of the disability resource center: to explain my situation and learn what requests might be considered relevant and reasonable. (e.g. What accommodations might reduce the social anxiety I experience around having to demonstrate my skills?) There’s information on the website, but it’s not really relevant to my situation. Reaching out for help with psychiatric issues isn’t easy. People say “go get help” like it’s the easiest, most obvious thing in the world. It’s not. It’s counter-cultural. It’s acknowledging a reality most people don’t want to accept: that we’re vulnerable and have fears and doubts and feel pain … That dedication and hard work (and good grades) don’t provide happiness, wellness, or financial stability. People don’t want to consider the possibility that maybe the dominant Western cultural expectations aren’t realistic and may even be harmful. They don’t want to believe that we’re honestly having a problem; they tell us we’re being lazy. Except that clearly it’s not everyone else. And when we do reach out for help, the response is far from welcoming and supportive. We’re put on waiting lists, required to fill out mountains of paperwork, interrogated, told we can schedule an appointment after providing documentation, etc. It fuels the cognitive distortions that are common in depression, especially “I don’t matter.” and “No one cares about me.” It makes following through on the initial request for help very difficult. Almost as though the very people who are supposed to be helping us don’t want to.